Why Shop? Swap! Back to School Tips! 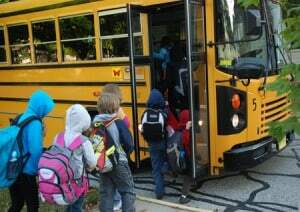 All around the US, children and their parents, teachers, and mentors are ramping up for the beginning of the 2012/2013 school year. Some schools, like ours' in south Florida, have already begun while others will open their doors after Labor Day. It’s always a time of excitement, perhaps a little anxiety, but it’s a rite of passage for not only our children but for ourselves as we support the students in our lives or perhaps have endeavored on our own academic journey. School shopping is to August what the holidays are to December. A flurry of cash, checks, and credit cards are exchanged, swiped, and deposited. 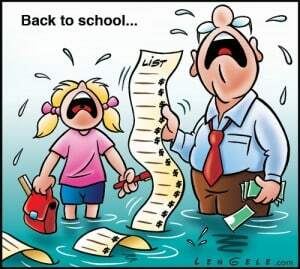 New clothes, school supplies, lunch money, PTA fees...the financial pressure of going back to school can be daunting and may in fact be the proverbial “wet blanket” to an otherwise momentous time. As I have established during my time as a blogger, I am an advocate for living within our means, reducing, reusing and, of course, recycling. Using these principles, I’ve devised a method (along with many other frugalistas) that can take the sting out of the financial requirements necessary to attend school, public or otherwise. Clothing Swaps. I love these! In a nutshell, you invite your friends to empty out their children’s closets (their own too if you want to include adult clothing) and after laundering them and folding them, organizing them by item (shirt, shorts, shoes), they bring their “excess” or donations to your house begin your swap. You can be as elaborate as you want. If you want the experience to have a retail feel, set up tables, decorate, whatever. It doesn’t have to be elaborate. The laundering, folding, and organizing is plenty of work, but everyone has their own idea of fun. To ensure a variety of clothing for girls and boys of varying ages, spread the invitation far along your grapevine. It’s surprising how many folks buy clothing for their children and those items are never worn. You’ll also get to see who the laundry-meisters are (mine is a Slavakian friend that irons everything...everything. Her “hand-me-ups” are the envy of any clothing swap). So many school children these days have to wear uniforms: khaki or navy shorts, skorts or pants and a collared shirts. These items wash well and can be used again and again. It makes sense and cents to reuse clothing that is standard attire. In addition to clothing, why not ask for unused or gently used school supplies? How many boxes of crayons does one household need? I invite you to go around your house and see how many pens and pencils you have, do we really need twenty pens? Extra supplies such as paper, Sharpees, high lighters, tape, glue are generally found in abundance in every household. Why not bring that third set of scissors for a chance to swap it out for that stapler you have needed for a while? Children outgrow not just clothes but shoes, athletic equipment, bikes, helmets, books, backpacks, lunch bags or boxes. Kids want new “themes” in their rooms, why not include lamps, furniture, left over wall paper or glow in the dark stars to the swap? Take a look in most suburban neighborhoods and any garage door that is open reveals piles of stuff. People cannot even park their cars into the garage because there are so many items clogging that space. Clear out that valuable real estate for a play room, a gym, or a place to park your vehicle. You can clean out your clutter and save lots of money by hosting a clothing swap. Additionally, by shuffling and sharing our goods between our friends and neighbors, we help keep waste out of the landfill: reduce, reuse. Going back to school is a hallmark of American life, no doubt a global one. It’s a time of newness, freshness, and a regathering of community; seeing friends and exchanging stories of the summer’s events. Why not make this time more special, more extraordinary by pitching in and creating a School Supply Swap? They are really easy to coordinate and a lot of fun. Just bring your hand-me-ups, a few reusable bags or boxes to haul your new goods and maybe a little nosh and coffee to warm things up. School teaches us to be creative and in these uncertain financial times, being creative is critical to our quality of life. Reach out, bring together, and swap! Forget the store, go next door! To everyone attending or supervising students, to all the teachers and folks that support education, here’s to you! Here’s to a happy, healthy and successful school year. Please share photos and stories of your Back to School Swap. Go ahead and upload them to the blog, the JumpSport Fitness Facebook page or on Twitter: @Fittrampoline. Until next week, be safe and enjoy the last few weeks of summer.